Biography: Dr. Thomas J. Scheff is Professor Emeritus at the University of California-Santa Barbara, USA. He holds a BS from the University of Arizona in Physics (1950), and a Ph.D. in sociology from the University of California (Berkeley) (1960). He is past president of the Pacific Sociological Association, and past chair of the Emotions Section of the American Sociological Association Some of his earlier publications are Being Mentally Ill, Microsociology, Bloody Revenge, Emotions, the Social Bond and Human Reality, Goffman Unbound! and Easy Rider. He is interested in creative teaching and integration of the social, political, behavioral and clinical arts and sciences, and particularly, the integration of these disciplines into new directions of thought and effort. He has honorary doctorates from the University of Karlstad, Karlstad, Sweden (2003), and Copenhagen University, Denmark (2008), and he has held visiting appointments at Carleton University, Canada, Oslo U., Norway, Lund and Karlstad Universities, Sweden. He is a former Chair of the section on the Sociology of Emotions, American Sociological Association, and former President of the Pacific Sociological Association. He published 158 articles in different journals and 12 books. Fellow, Social Science Research Council, 1963-64. NSF Grant, "Testing a Theory of Social Coordination," 1967-69. Visiting Fellow, Social Science Research Institute, University of Hawaii, 1967-68. Distinguished Teaching Award, Academic Senate, University of California, Santa Barbara, 1979. Task Force for Self Esteem, State of California, 1988-89. California Policy Seminar Grant: Reforming Crime Policy, 1990-91. Outstanding Volunteer Service to the Community, 1993. UCSB Community Affairs Board. Distinguished Lecture Grant, California Wellness Foundation 1996. Sociological Practice Award, Society for Applied Sociology 1999. Lifetime Achievement Award, Sociology of Emotions Section, ASA 2000. Honorary Doctorate, University of Karlstad, Karlstad, Sweden 2000. Visiting Professor, Lund University, Lund, Sweden, 2001. Lee Founders Award for Lifetime Achievement, Society for the Study of Social Problems, 2002. Eilert Sundt Lectureship, University of Oslo, October 2002. Lifetime Achievement Award (with Suzanne Retzinger) ASA Section, Peace and Conflict 2003. Honorary Doctorate, Copenhagen University, 2008. Constantine Panunzio Emeritus Award, All UC System, 2012. Consultant, Joint Information Service of the American Psychiatric Association and National Association of Mental Health, 1966. 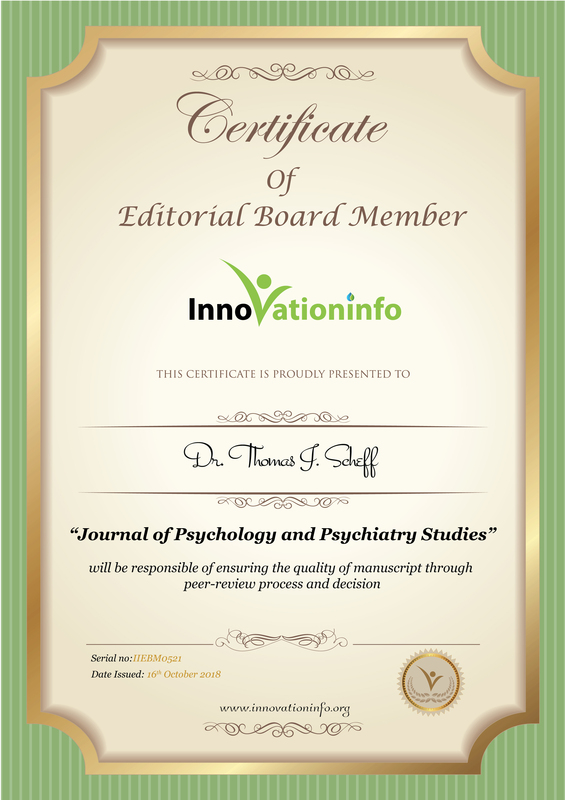 Associate Editor, American Sociological Review, Journal of Health and Social Behavior. Social Problems, 1965-68. Visiting Scientist, NSF Visiting Scientist Program 1964-65. Member, Advisory Council on Mental Health, State of California, 1968-71. Associate Editor, Contemporary Sociology, 1975-76. Associate Editor, The American Sociologist, 1976-78. Council, Section on Social Psychology, American Sociological Association, 1978-79. Consulting Editor, American Journal of Sociology, 1980-81. Associate Editor, Symbolic Interaction, 1985-87. Consultant, Task Force on Self Esteem, State of California, 1987-88. Chair, Sociology of Emotions Section, American Sociological Association, 1989-91. Council, Section on Theory, American Sociological Assoc., 1993-96. Organizer, Conference on Shame and Related Emotions, Santa Barbara, Ca. 1994. Editor, Special Issue on Shame and Related Emotions, American Behavioral Scientist, 1995. Consultant, Research School of the Social Sciences, Australian National University, Canberra, 1995. President, Pacific Sociological Association, 1996. Editor, Special Issue on Qualitative Methods in Health Research, European Journal of Public Health. 1997. Moderator, Electronic Forum on Shame Research., 1994-. Co-Moderator (with Javier Trevino) of Electronic Forum on Erving Goffman, 2000-. Universal Expressive Needs: A Critique and a Theory. Toward resolving the controversy over "thick description"
Freudian Repression, by Michael Billig. Curtailment of emotions in pop songs and novels. Unpacking the Civilizing Process: Interdependence and Shame. The Emotional/Relational World: Shame and The Social Bond. Shame and social bonds: On social inferiority and protracted conflict. Goffman Unbound: A New Paradigm. Runaway Nationalism: Alienation, Shame and Anger.